Do you have a high pressure power washer that needs to be fixed, repaired or has worn out parts that need replacement? Or perhaps it's just time to take care of some general maintenance? Then you've come to the right place! Midwest Service Equipment has experienced technicians ready to service most brands of commercial pressure washers. Our qualified service technicians are ready to assist you. Midwest Service Equipment can service all brands of hot and cold water pressure washers. (Including Landa, Hotsy, Mi-t-m, Hydrotek, Alkota, Aaladin, Delco and more). 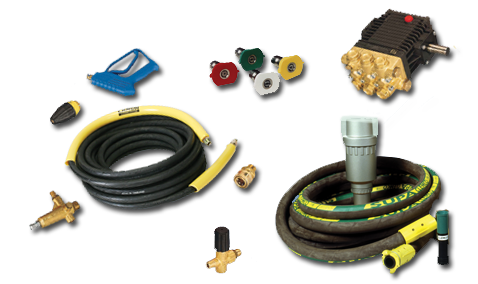 Because many of our power washer repair and replacement parts are universal and can be used with most any brand found in the marketplace, we try to keep a small in-house stock of the parts (hoses, valves, pumps, nozzles, wands, trigger guns, etc. on hand). MSE maintains a sizable inventory of accessories and replacement parts such as hoses, hose reels, wands, trigger guns, rotary nozzles and spray tips, quick connect sockets and plugs, unloader valves, soap metering valves, screens and much more. We also carry a wide range of new and used pumps and motors. If we don't have it in stock, we'll get it! If you would like to order parts or you have questions, simply contact us. Download our Parts and service catalog, to find the part your looking for and give us a call and we'll get it for you ASAP! Please fill out the form below to request service or if you need more information.